Eastern Europe has become a hot shooting destination for Bollywood films over the last year. Kick, Bangistan, Shandaar and Dilwale are just some that have been shot in Poland or Bulgaria. Riteish Deshmukh and Pulkit Samrat spent more than a month shooting around Poland for their upcoming release, Bangistan (August 7). Deshmukh recalls the experience fondly. Apparently the Polish crew would greet the Indian crew with a different Hindi phrase every morning, from simple things like a�?aap kaise haina�? to a�?aaj khaane pe XYZ milegaa�?. Said Deshmukh, a�?The Polish crew was sweet and loving.a�? Between shooting days, the team also managed some sightseeing. One of the most unforgettable experiences was visiting the infamous World War II Auschwitz concentration camp close to the city of Krakow. a�?It is a scary place even now. There are two tonnes of human hair on display that belonged to the victims. I really didna��t know humans could be so cruel,a�? reflected Deshmukh. Today is the final test for Ajay Devgn and Nishikant Kamat, as their Hindi remake of Drishyam opens in cinemas. Being the thirda��after the original in Malayalam, followed by the Tamil versiona��Devgn is sure to be compared to Mohanlal and Kamal Haasan. Devgna��s recent films have been high on action and inanities and low on drama and performance (Himmatwala, Action Jackson). One wonders what happened to the actor who sparkled in films like Zakhm, Omkara and Yuva. However, this time the bar has been set high by his senior colleagues already having interpreted the part of a simple man fighting to protect his family in this thriller. Devgn plays middle-class family man Vijay Salgaonkar, whose wife is enacted by Shriya Saran. There is Tabu in an inspectora��s role and Rajat Kapoor is cast as Tabua��s husband. Similarities in the story of Drishyam and the Japanese book, The Devotion of Suspect X, are hard to ignore. The book is also slated to be officially adapted into a Hindi film by Sujoy Ghosh (Kahaani). While Salman Khana��s Bajrangi Bhaijaan continues to do storming business at the box office, the actor who stole hearts and garnered universal praise is Harshaali Malhotra. She is the child who plays Munni/Shahida, and who elects Khana��s character Pawan as her guardian angel and guide back across the border to her home in Pakistan. It seems casting director Mukesh Chhabra was given the brief that the child must have a smile that will light up the screen, especially as she plays a mute girl. It was after auditioning some 5000 children from across India that he zeroed in on Malhotra. 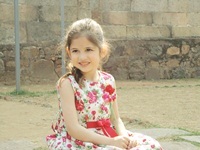 The Mumbai-based seven-year-old has previously acted in TV serials and ad films. Ita��s not very common for a short film to get the kind of publicity and attention that Sujoy Ghosha��s Ahalya received when it premiered on YouTube last week. Radhika Apte, the lead actress in the 14-minute film, even hosted a special screening for the media and was happy to share anecdotes about the experience of shooting in Kolkata, with Bengali star Soumitra Chatterjee. This is not the first time the 29-year-old Pune born and educated actor has acted in a Bengali film. In fact, her versatility extends to Marathi, Telugu, Tamil and Hindi films, tooa��with her last releases being Badlapur and Hunterrr. She will soon reunite with her Badlapur co-star Nawazuddin Siddiqui for Ketan Mehta’sA�Manjhi – The Mountain ManA�and then she will be seen with Kunal Kapoor inA�Kaun Kitne Paani Mein. Ita��s turning out to be quite a year for the young Apte. Set against the backdrop of funeral pyres on the banks of the Ganges, Ghaywana��s Masaan floats beyond the small town it calls home. Where Devi (Chadda) deals with humiliation after shea��s found in a seedy hotel, her father (Mishra), who plays a priest, comes to terms with his daughtera��s sexual freedom. Then therea��s the soft-spoken Deepak battling the stigma of being from a lower caste family. With a tightly-woven script, ita��s a study of social mores, love, loss, and determination.